We have tested many LED’s – take a look at our youTube channel. We have found huge issues with stocking LED’s. Many manufacturers lie about the output of the unit. They lie about the equivalent HPS wattage. They lie about the ‘actual’ power draw. They add fans and other nonsense to increase the power usage without increasing the light output. An equivalent output to a 600w HPS would be around 420w for an LED if they are good units. Blurple is nonsense and just a gimmick. It looks nice and sciency but plants evolved to live in sunlight so emulate sunlight the best you can. Many units are not returnable. Especially true buying from China. We have bought LED’s they were not of a high enough standard but to return them would cost around €280 in shipping cost. For this reason we have no stock of LED’s at the moment and our advice is to use either a good HPS setup with digital ballast or a CMH setup. Both are solid technology and have been in use for years. 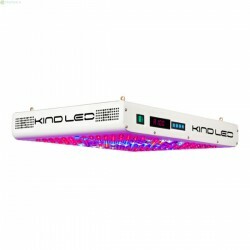 Always check back here as we will stock LED’s from time to time that we feel are worthy of being in our store. At the moment we are looking at the Fluence Spydr 2 which has top of the table results but also top of the table pricing. We’re also looking to test a Chinese version of of the HLG Quantum Board 288 , just ironing out the import duty issues.